A 54-year old man was brought to our hospital with the complaints of swelling in left thigh and groin for 25 years duration. He has undergone treatment and surgery (3 times) for the same complaints from various hospitals, but the swelling still persisted. After initial evaluation and imaging studies he was taken up for excision of the lesion by a team of surgeons including Surgical Oncologist, Vascular Surgeon and general surgeons. 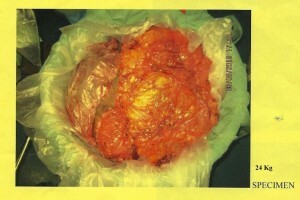 A large fleshy lesion of 24 kg weight was removed from the left thigh, groin, perineal and gluteal area with an approximate blood loss of 3000 ml and the Defect was covered with a skin flap. Post-operatively he was supported by artificial ventilation and Inotrope, which was gradually weaned off. His condition improved and he was mobilised. 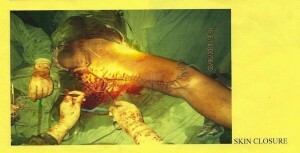 Now he is being planned for 2nd stage surgical excision of intra-peritoneal extension of the mass.